Japan is a year round destination and winter is one of the best times of the year to to experience it. 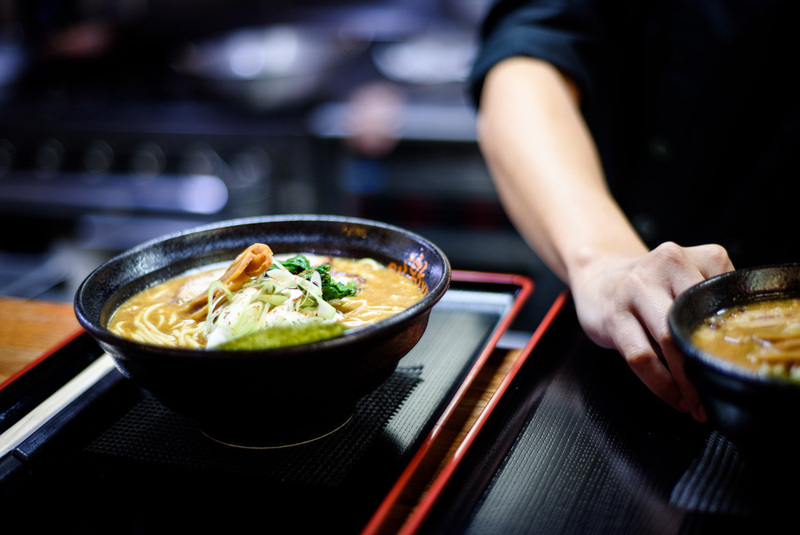 The streets are lit up at night and blanketed in snow, the markets are bustling a piping hot bowl of ramen tastes especially good when it is below zero outside!. This is a brief but full trip that gets the most out of the northern region of Hokkaido in a relatively short amount of time.. Venture far afield to the remote Lake Akan and appreciate the beauty and fragility of the winter home of endangered cranes.. Stroll along the snow covered canals of Otaru and try your hand at the local art – kitakarou glass blowing. Konnichiwa! Welcome to Tokyo, Japan's dynamic capital where the ultra-modern meets the ancient. You will share a shuttle transfer to your hotel upon arrival. Your adventure begins with an important welcome meeting at 6pm. You'll meet your leader and group at this meeting. Check the hotel reception or noticeboards for the location of the meeting. We'll be collecting your insurance details and next of kin information at this meeting, so please ensure you have all these details to provide to your leader. After the meeting you may choose to explore Tokyo's neon lit night, or perhaps join your leader at a local restaurant for a tasty dinner. After breakfast you will travel via Shinkansen (bullet train) to Hokkaido, Japan's most northerly island, and the historic port city of Hakodate (4.5 hours). The Western-style wooden buildings and brick churches of this picturesque city were built by the small international community that moved here after the Kanagawa Treaty of 1854 opened the ports of Shimoda and Hakodate to American trade. After settling in you will visit Goryokaku, a massive, star-shaped citadel built in 1864 for the defence of Hakodate against the imperialist threat posed by Western powers. A few years later, the fort became the site of a civil war between an army of the shogunate and troops of the newly established Meiji government. It was eventually turned into a public park. In the center of the fort stands the meticulously reconstructed Magistrate Office, from where the officers of the shogunate administered Hokkaido. The best view of the citadel's design is from above, and your tour includes a visit to the 107 metre (351 foot) Goryokaku Tower. This morning,we head out to Hakodate Morning (Asaichi) Market. Famous for the freshest seafood such as crabs, salmon eggs, sea urchin and shellfish, it is also a great place to find fresh seasonal produce. If you are feeling hungry it is a great place to pick up a delicious brunch. If it's a clear day/night we also head up to the Mount Hakodate Ropeway for a dazzling view of the city. Your celebration of winter continues with today's journey to Sapporo. 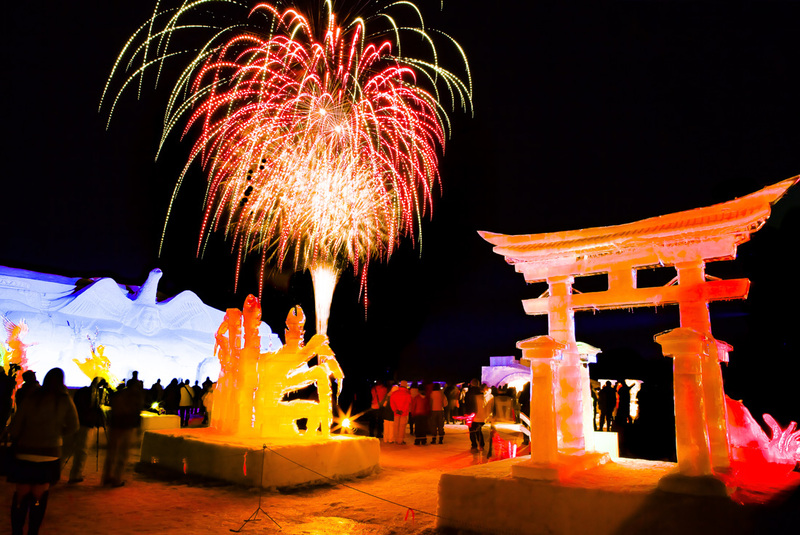 The largest city in Hokkaido, Sapporo is transformed every February during its weeklong Yuki Matsuri (Snow Festival). Today wil be dedicated to exploring Sapporo. Specifically, Odori Park, the main site of the Sapporo Snow Festival;What began with a few high schoolers building snow castles in 1950 has grown into an event that draws more than two million visitors from around the world and includes hundreds of snow sculptures of everything from famous monuments to international celebrities. As the festival has grown, other forms of entertainment have been added, including concerts, food stalls, art exhibitions, and areas for ice-skating, ice-sliding, snow-tubing and snowmobiling.We'll also visit the historic Sapporo Clock Tower, built in 1878, which is one of the few American style buildings still standing, now is a museum introducing the history of the Agricultural College and the development of Sapporo. You will be pleased to discover that despite the wintry conditions Sapporo's underground pedestrian passageways and trains make getting around the city a breeze. Head to the small, picturesque harbour city of Otaru today. During Hokkaido’s rise in the late 19th and early 20th century, Otaru thrived as a port city and many Western-style buildings were built in its centre. Many of those buildings have been converted into restaurants, cafes, boutiques and museums, and today you will take a walking tour past many of them along Sakaimachi Street. Your tour will also visit Otaru’s canal, beautifully restored in the 1980s and the current site of the annual Snow Light Path Festival, and the historic Music Box Museum, home to a collection of over 25,000 antique and modern music boxes. When the local herring fishing industry declined in the 1950s, local glassmakers who previously made glass fishing buoys began producing highly regarded glassware, and today you will enjoy a hands-on experience making a piece of local Otaru glassware for yourself. Later in the afternoon you will visit Tanaka Sake Brewery for a look at how high-quality sake is made and, lucky for you, how 10 brands taste. You may also be able to nibble some sake cake, made from the fermentation process’s tasty rice residue, or local vegetables pickled by sake. A short train journey back to Sapporo will be followed by a train and bus trip to Sounkyo, a small town known for its hot springs at the base of Kurodake Mountain. 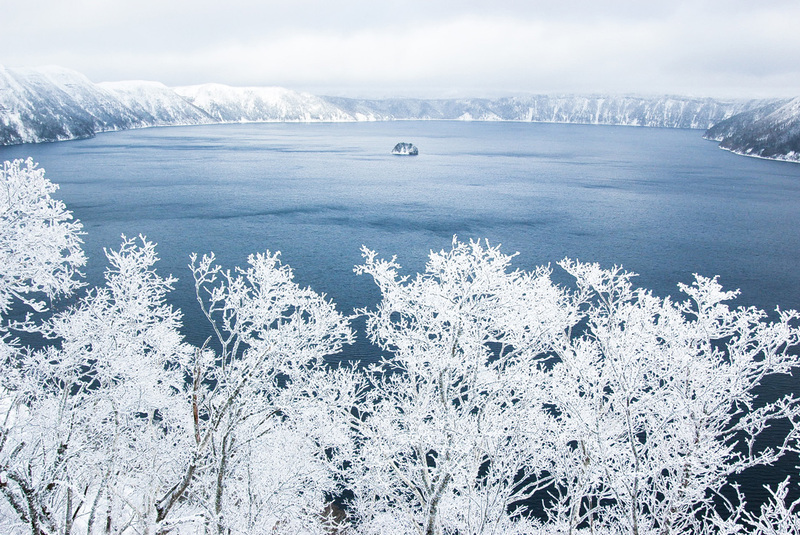 Located in a narrow gorge flanked by 100-metre-high, forested cliffs, this region is also known as one of the coldest parts of Japan - so make sure you bring your winter woolies. If you are lucky enough to be here during the Sounkyo Ice Festival (mid-January – end of March) you will witness a crazy landscape of tunnels, caves and stairways made totally from ice that are lit up with many colours at night. The festival takes place along the Ishikari River. While the layout of the festival can change from year to year, it normally has large ice sculptures, snow domes and a snow tubing run (small fee required to rent tubes). There's also a stage area built out of snow, where various shows and events are held. If you haven’t already indulged then now is a perfect time to try the onsen facilities at our hotel. Reputed to have restorative properties for body and mind most onsens have separate male and female baths and it's customary for guests to shower before bathing sans clothes. A truly relaxing and rejuvenating treat. A free day in a winter wonderland. Weather permitting venture out into the gorge that gives Sounkyo its name and runs 24 kilometers (15 miles) along the Ishikari River; you may wander on riverside paths where frozen waterfalls hang in mid-air. If the weather is clear you may opt to ride the Kurodake Ropeway to the higher reaches of Daisetsuzan National Park and near the summit of Mount Kurodake. Sounkyo offers the ultimate wintertime indoor activity, of course, as you have several hot spring baths to choose from in town. On the way to Lake Akan you will stop at a reserve largely credited with saving a national symbol from extinction. 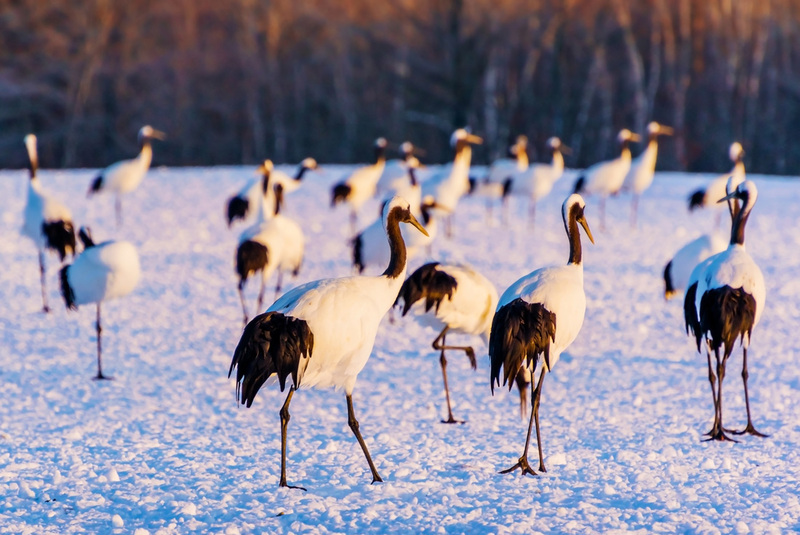 The Akan International Crane Centre is a museum, breeding centre and sanctuary devoted to the rare red-crowned crane (also called Japanese crane). Beside it is the Tancho Observation Centre, which provides food for the birds during the winter months when snow covers the ground. Overhunting in the 19th century and loss of habitat in the 20th meant that in 1924 less than two dozen cranes were thought to survive in the nearby Kushiro marshes. The bird, a potent icon of happiness and long life in Japan, was declared a National Monument in 1935. With gradual protections and support the crane recovered and became a preservation success story: In the early 21st century its numbers surpassed 1000, and there are now about 1300 cranes in Japan. You will learn more about the crane's story and see them during included visits to the Crane Observation Centres. From there you will continue to Lake Akan, a scenic crater lake in Akan National Park, where you can walk forest trails that lead to bubbling mud pools. Along the shores of Lake Akan is the small village of Ainu Kotan, home to about 200 Ainu, the indigenous people of the area. You might like to take a visit to the Ainu Museum, which holds displays of musical instruments such as the mukkuri (a kind of mouth harp) and the zither-like tonkori as well as traditional implements and clothing. It cannot be guaranteed, but you may experience the Ainu’s haunting songs and dances celebrating nature. Alternatively, depending on the time of year (and freezing) there are options for activities such as ice fishing, and snow shoeing. Travel back to Sapporo today. Visit Hitsujigaoka Observation Hill, where you'll get a great view of the city beside a statue of William S. Clark, the first vice-principal for the Sapporo Agricultural School (presently Hokkaido University). From here it's off to the much loved Sapporo beer museum in Japan. Established in 1878, Sapporo Beer is Japan's oldest beer brand. The museum is housed in an 1870 red-brick building that was part of the Sapporo beer factory until 1965. It was renovated and opened as a museum in 1987. After learning about the history of beer brewing in Japan and its current status as the country's favourite type of alcohol, you may enjoy partaking in the many beers on offer, one of which is a recreation of Sapporo beer's original recipe. This busy day ends with an included meal that's a Hokkaido speciality. Jingisukan -- ''Genghis Khan', legendary founder of the Mongol Empire -- is a dish consisting of meat (usually lamb) and vegetables cooked on a dome-shaped metal grill in the middle of the table. The meat is dipped in a soybean based sauce and eaten right off the grill. It will provide a fitting final meal of your Japanese winter adventure.